A British medical journal has published an article about intermittent fasting without disclosing that it is written by the author of a best-selling diet book on the subject. 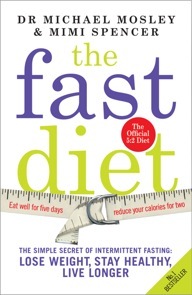 Dr Michael Mosley is the BBC health journalist who co-authored The Fast Diet which sold more than 400,000 copies in the UK alone in the first six months of this year and is a top seller in the US and Australia. The book’s January release preceded the publication of an academic article on that very diet method – intermittent fasting – co-authored by Dr Mosley in the March-April issue of the British Journal of Diabetes and Vascular Disease. Its Article Notes featured the statement: “The authors declare no conflicts of interest in preparing this article”. When asked about this, lead author Dr James Brown and the journal’s executive editor Dr Caroline Day, both from Aston University, said there was no conflict of interests because the research review article did not cite Dr Mosley’s book. However, bioethics experts and the ethical codes for medical journals do not appear to use this as a criterion for disclosure. The journal states on its Sage home page that it is a member of the Committee on Publication Ethics (COPE). The ethical codes do not state explicitly that authors of popular books must declare a conflict. Rather, they state personal interests and commercial relationships should be declared. The COPE Code of Conduct directs journal editors to have systems in place for dealing with conflicts of interest (s17.2) and in turn references the British Medical Journal (BMJ) transparency policy and the International Committee of Medical Journal Editors (ICMJE) requirements. The ICMJE requirements include “dual commitments, competing interests, or competing loyalties” in their definition of conflicts of interest. Even without the book, Dr Mosley appears to have such competing interests – as the presenter of a top-rating Horizon program that popularised this diet method when in it was broadcast on BBC2 in August 2012. Dr Mosley is also on the speaking circuit, with his appearances with the JLA group advertised in the £2500-£5000 per appearance fee band and Catalyst World Class Speakers billing him in the £1000-£5000 category. Clinical ethicist at Bond University in Australia, Associate Professor Katrina Bramstedt, has performed more than 800 ethics consultancies and says such a conflict should normally be disclosed. “I can’t imagine not making a disclosure … just as you would need to disclose any consulting relationships,” she said. “You have a self interest when you publish something for popular media – you make income off that. Dean of Arts at the University of Tasmania, bioethics researcher Professor Susan Dodds, agrees. “I think if the book’s out and the researcher is publishing work that adds credibility to their commercial book by getting people interested in that area there could be a conflict of interest,” the bioethics researcher said. “Some of the health issues don’t get regulated at all so there’s a concern that people are lending scientific credibility to areas that are much more at the level of marketing or the level of building a consumer base rather than what we ordinarily think of as tested research practice. That’s exactly what appears to have happened in some quarters, with readers on a dedicated online forum about the Fast Diet citing the research article as support for the diet proposed by the book. According to the article’s lead author Dr Brown, the research article had been downloaded more than 10,000 times by July. Some forum commenters started to raise concerns back in April about the journal’s lack of a disclosure of a conflict of interests by Dr Mosley. Associate Professor of Urology and Pathology at the Duke University Medical Center in Durham, North Carolina Dr Stephen Freedland, has researched in the area but was quoted in a recent edition of the Canadian Medical Association Journal expressing his scepticism about diet books. Lead author Dr Brown has shown an interest in medical research ethics in his Twitter feed. But he and editor Dr Caroline Day feel there is no need to disclose a conflict of interests in this case. Instead, they argue there was no need to declare Dr Mosley’s book, publishing contracts or sponsored appearances as conflicts of interest because the book was not cited in the article. Clinical ethicist Dr Bramstedt said she did not accept the authors’ and editors’ argument that there was no need for a conflict declaration because the diet book was not cited in the article. “I’m an associate editor for a bioethics journal and I wouldn’t buy that – no,” Dr Bramstedt said. Professor Dodds said if a work was not being sourced it need not be cited, but that was a separate issue from a declaration of interests. “It may well be the case that a person who is making a killing off diet books that they ought to at least express an interest but they do not necessarily need to refer directly to the work,” she said. Author of the best selling GI Factor series of books, Professor Jennie Brand-Miller, routinely discloses her potential conflict in peer-reviewed journal articles. Clinical ethicist Dr Bramstedt doubted a failure to disclose an interest would require a retraction of the article, but an addendum or erratum could be added to at least the online issue of the journal. “I’ve seen missed disclosures reported like that in various journals,” she said. “I think in those types of situations the editor should take a second look at the paper to see if that paper actually needs to go back to peer reviewers to see if there might in fact be any bias now that this new revelation of conflict of interest has been disclosed. 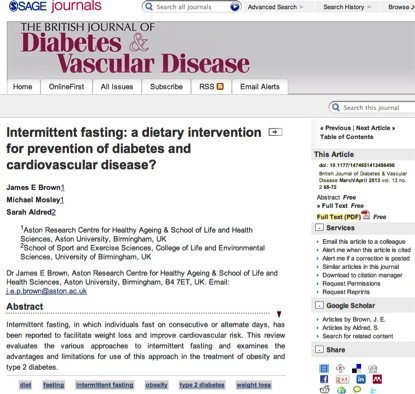 Lead author Dr Brown would not confirm whether he has co-authored further academic articles with Dr Mosley, but his Twitter feed suggests more co-authored articles and review articles on intermittent fasting are in the pipeline for publication. Dr Bramstedt suggested the authors should consider declaring such a conflict in any future papers they co-author with the best-selling author. “I think so unless they still have in their mind a philosophy that says ‘we really don’t think we have to do this’, but you would think that they would wise up a little bit,” Dr Bramstedt said. This is certainly not a one-off case. In fact, as Ivan Oransky reported in MedPage Today last week, non-disclosure is common with at least half of clinical trial study authors failing to report relevant conflicts of interest, according to a Danish analysis of papers. Dr Mosley has not yet answered my requests for a response but I will certainly update this blog with any comments he provides. Meanwhile, what are your views on this? Is there an ethical obligation on popular diet book authors to disclose that in their scientific journal articles? Please comment below. (All comments are moderated). I believe the fasting diet could supersede Atkins diet,I believe the journal has an obligation to disclose the author.